The PXC 450 is a premium around-the-ear travel headphone set featuring Sennheiser’s exclusive NoiseGard™ 2.0 active noise compensation system, which effectively reduces up to 90% of ambient noise. The extremely comfortable headphones offer audiophile-grade sound combined with a foldable construction for maximum enjoyment and convenient storage. The innovative new TalkThrough function allows the user to communicate with neighbors without taking off the headphones. Unwanted background noise, such as the roar of the airplane engines, is filtered out so that only the neighbor’s voice is passed on through the headphones at top quality. Just one AAA battery is all it takes for up to 16 hours of serene enjoyment. The PXC 450 also functions as a passive headset when used without batteries, so audio always works. Adaptive baffle damping and patented Duofol™ diaphragm technology for pristine audio production. Switchable NoiseGard™ 2.0 reduces ambient noise up to 90%. Active/bypass mode for use as a noise cancelling or closed-back audiophile headphone. Luxurious materials for long-lasting comfort and exceptional durability. TalkThrough function for easy communication with the people around you while wearing the headphones. Simple-to-use volume control integrated into the headphone. Ideal for use with in-flight entertainment systems, MP3 players as well as home entertainment systems. 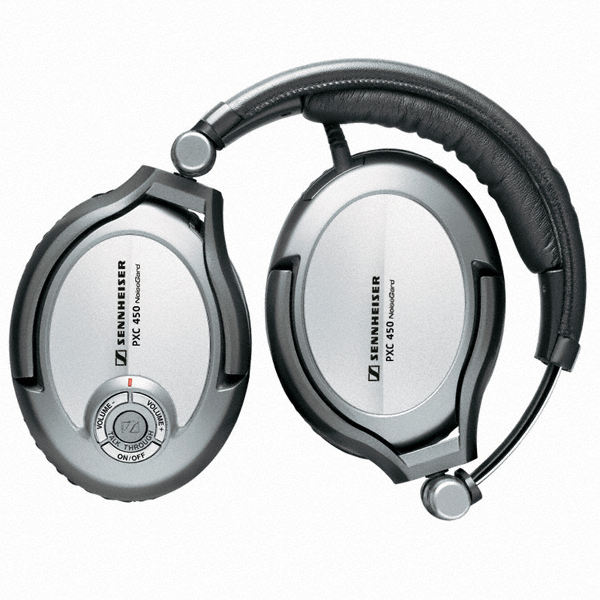 Single-sided, detachable cable and replaceable ear pads for extended operating life.